…just for commenting on the Design Team Blog Posts, you have a chance to win a $10 NCC Gift Certificate good towards the purchase of NCC stamps. You have until August 30, 2015 at 10:00PM EDT to leave a comment on the participating designers' blogs for a chance to win. Two random winners will be selected from the comments on the designers' blogs. The winners will be announced on the NCC Blog on August 31, 2015. Be sure to check back there to see if you have won. 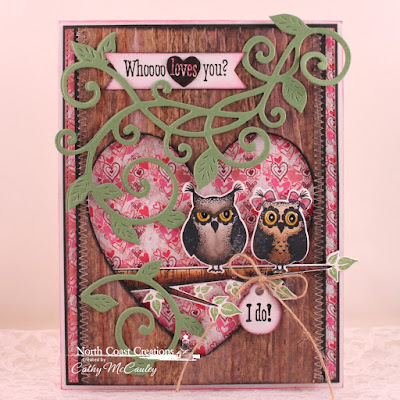 Creative Nugget: The ODBD Heart & Soul Paper Collection was perfect for the background for my card. The tree trunk was made by swiping brown, rust, and white ink pads down a panel of Kraft card stock then embossing with a wood grain embossing folder. The Ornate Hearts Die was used to cut the heart in the tree trunk. Images from the Who Loves You? 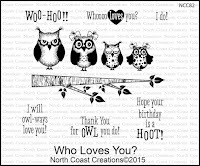 stamp set were colored with Copic Markers and cut with matching Owl Family Dies. Glossy Accents was added to the owls' eyes. 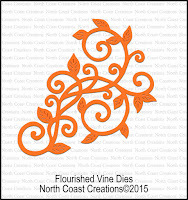 The new NCC Vine Die was used to cut some foliage for the tree. 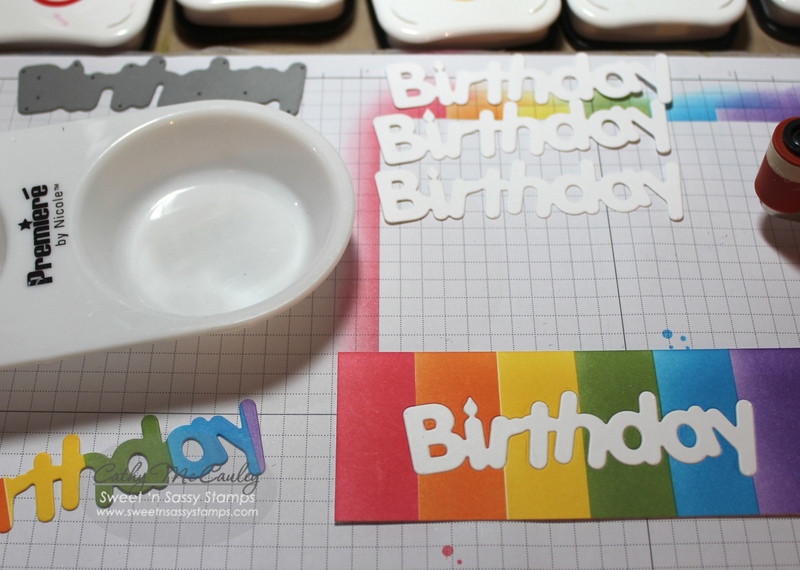 The sentiments were cut with the Pennant Die and the Mini Tags Die to finish the card. Creative Nugget: This card was so much fun! Loved coloring this little owl family in bright colors. The background was made by dabbing Mixed Media paper onto watered down distress inks on a craft mat. 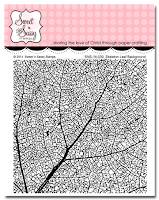 The clouds, cut with the ODBD Clouds & Raindrop Dies, were cut from scraps of the same paper. An extra branch was stamped in green so the leaves could be fussy cut and added to the branches. The Who Loves You? 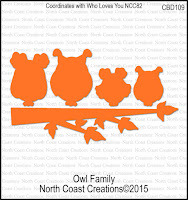 owls were cut with the matching Owl Family Dies. These owls are so cute! 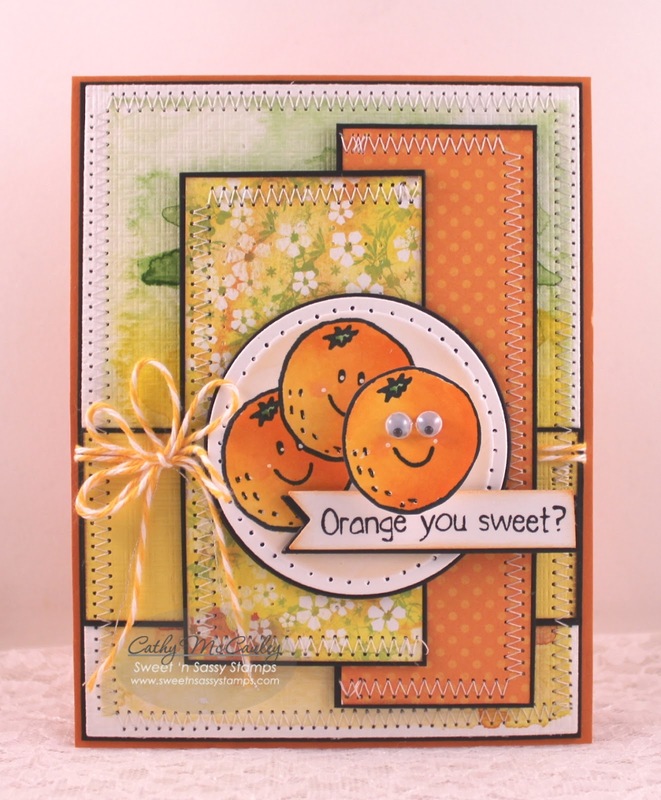 To see more adorable cards made with stamps and dies from this release, hop on over to the North Coast Creations Blog. Be sure to click on the links below to see details for each fabulous project. Thank you so much for stopping by…have a wonderful day! Hello everyone! Pennants tend to give your card design a festive look, and now with these new pennant stamps by Our Daily Bread Designs it's easy to customize your pennants! 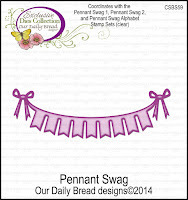 Today the Bread Sticks are showcasing fabulous pennant cards for your inspiration. Come take a look! 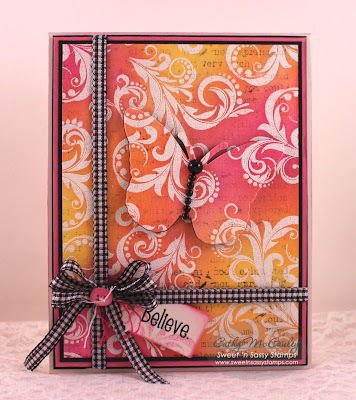 Creative Nugget: The background was made with paper prints from the Beautiful Boho Paper Collection and pieced together following THIS TUTORIAL on Splitcoaststampers. The background was then embossed with the Boho Background Die giving it a quilted look. 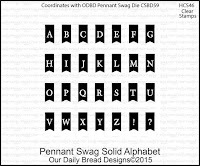 The pennant was cut with the Pennant Swag Die and the new Pennant Swag Solid Alphabet made it easy to customize the greeting for my card which could be used for many different occasions. The little heart separating the two words was cut using the Clouds & Raindrops Die. The Fancy Fritillary Die was used to cut two butterflies out of Beautiful Boho paper and black card stock which were then layered and adhered to the card. To see more pretty pennants, hop on over to the Our Daily Bread Designs Blog…then be sure to stop by the designers' blogs to see the details for each project. Leave a comment to let them know you stopped by! Thanks so much for stopping by! Enjoy the hop and have a wonderful day! Hello, dear friends and happy Saturday! I love seeing all the gorgeous cards out there using color gradients and while many of those are clean and simple, I still need a lot of practice with that style! LOL! I am; however, having fun with ombre techniques! 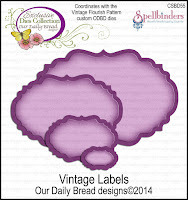 Creative Nuggets: All stamps and dies are from Our Daily Bread Designs. Purple and green distress inks were sponged over the embossed Boho Paisley Background, fading the colors towards the middle of the panel. 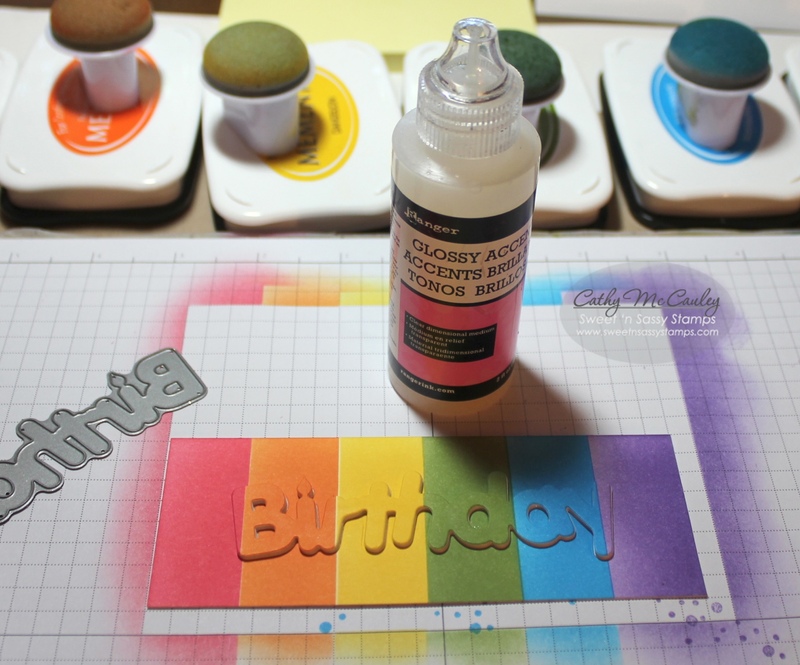 The Boho Background die cut was layered over the ombre background. 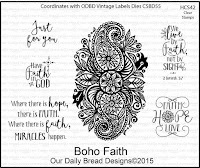 The sentiment from the Boho Faith stamp set was stamped and matted on Ovals and Stitched Ovals. A Fancy Foliage vine was sponged fading the colors for an ombre look. The little bird and flowers were made using the Spread your Wings stamp set and the matching Birds & Nest Dies. The colors for this card were inspired by the ODBD Shining the Light Inspiration Challenge. Hope you like it! Welcome, my friends! 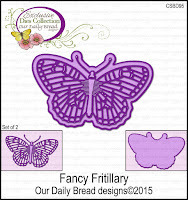 Today we are taking a look back at Our Daily Bread Designs August 2015 Release. I'm having so much fun with the bright colors and the paisley designs from this month's Boho collection of new products. 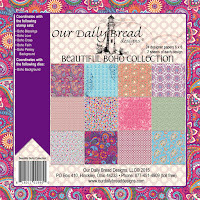 Get ready to feast your eyes on the beautiful projects that the fabulous Breadsticks have prepared for you today using the new August stamps and dies from Our Daily Bread Designs! 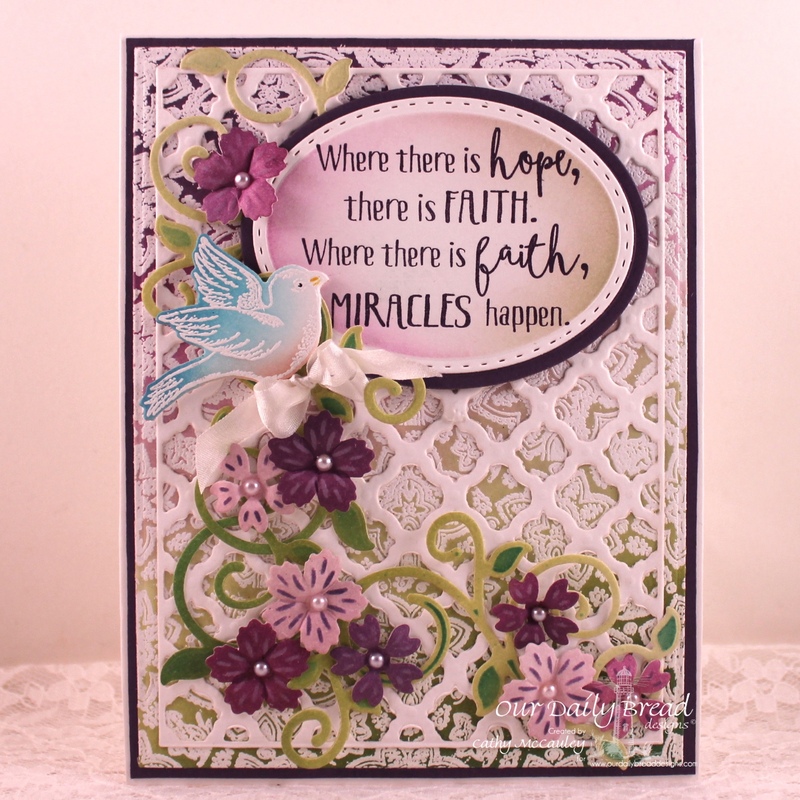 My sample card today uses the Boho Faith and the Boho Paisley Background stamps as well as the Boho Background Dies and the Faith, Hope & Love Dies. Creative Nugget: I love using emboss resist techniques with the beautiful Boho Paisley Background stamp. 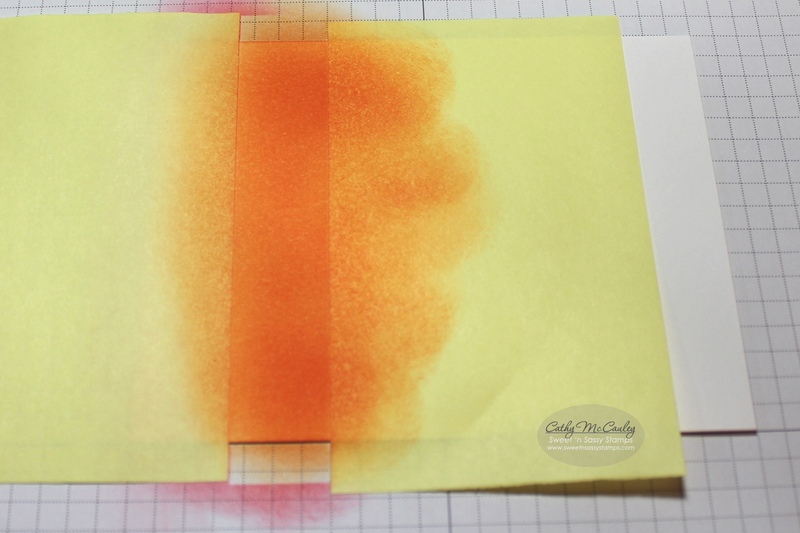 Distress inks were sponged over the embossing to create the background for this card. The side panel was embossed with the Boho Background Die and stitched to black card stock and the edge of a Beautiful Border die cut. 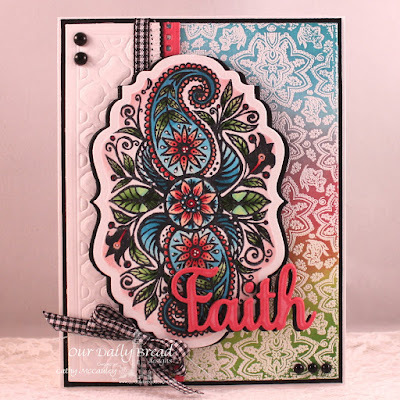 The paisley image from the Boho Faith stamp set was colored with Copic Markers to match the inks on the background, highlighted with a Sharpie Paint Pen, and cut and matted using the Vintage Labels Dies. 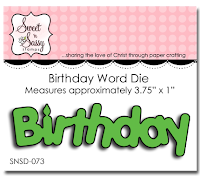 The Faith word die was cut three times from coral card stock and once from black and layered for dimension. A little gingham ribbon and some pearls were added to finish the card. 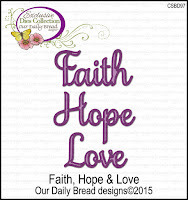 Hop on over to the Our Daily Bread Designs Blog to see all of the beautiful creations and be sure to visit each of the Breadsticks' blogs to see the details for each project. Hello, friends! 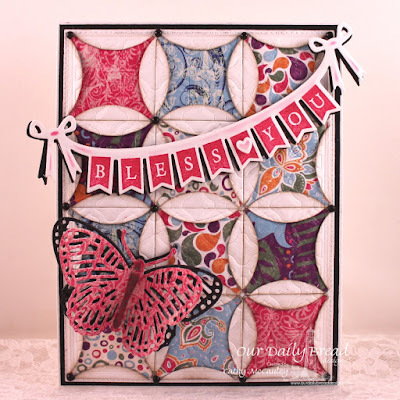 Welcome to Sweet 'n Sassy Stamps August 2015 Release Blog Hop! We are super excited not only about the three brand new stamp sets being released this month, but also about adding a brand new illustrator to the Sweet 'n Sassy Stamps team…Karla Dornacher. Karla is an inspirational speaker, writer, and illustrator whose Bible journaling designs are just amazing! 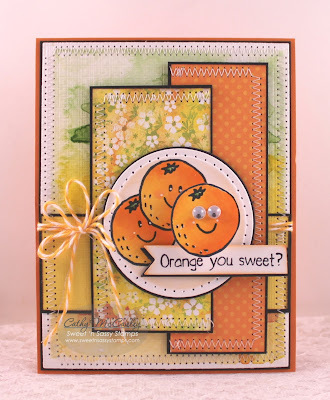 You will see the stamp set she designed for Sweet 'n Sassy Stamps this month as you hop along to the different Design Diva Blogs. Sweet 'n Sassy Stamps line. 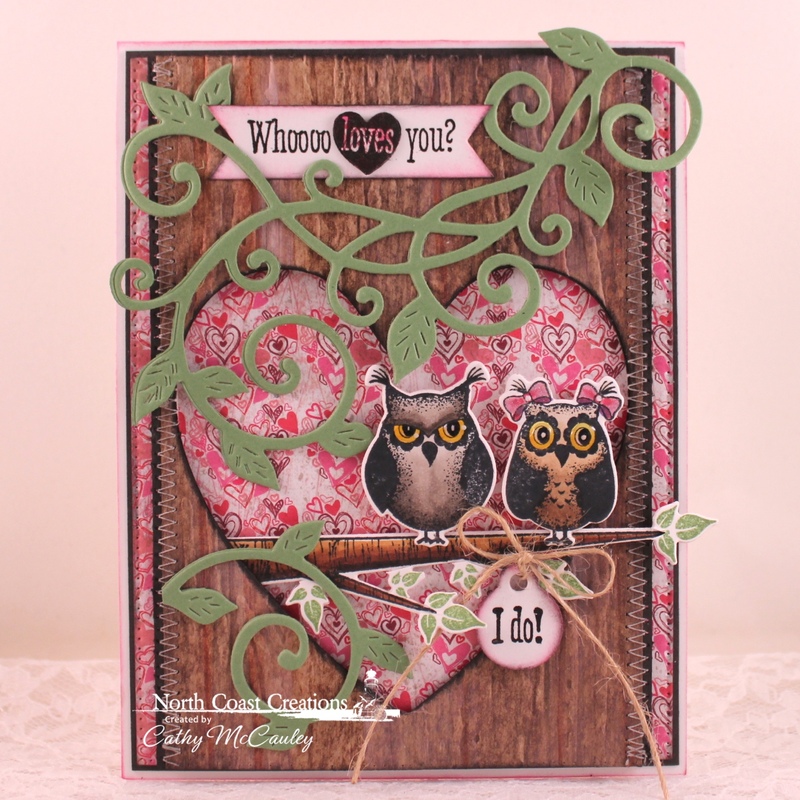 The vintage looking silhouettes and beautiful sentiments in the set can be used to create sweet baby gifts and cards. Creative Nugget: The Floral Pattern Background was white embossed on Neenah card stock and sponged with Distress Inks. This panel was cut diagonally and stitch to the embossed Dotted Swiss layer. The sweet footprints from the Little One stamp set were also white embossed and sponged with the same colors as above. The sentiment was white embossed on pink card stock and hand cut into a banner. A Scallop Border was embossed with Swiss Dots and attached to the banner. Dyed ribbon and some rhinestones were added to finish the card. 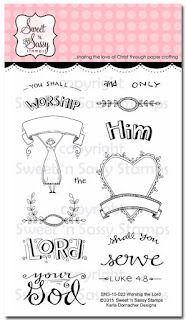 My next sample was made with Karla's new stamp set, Worship the Lord. 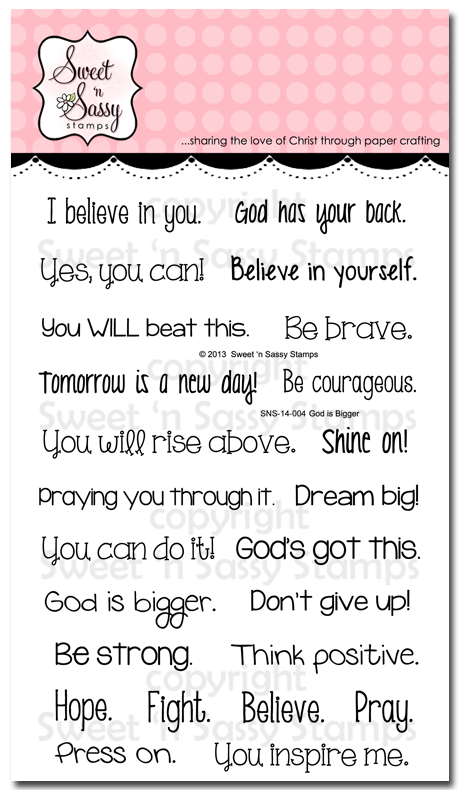 Not only can this fabulous stamp set be used to create cards, but bookmarks and Bible Journal entries as well. 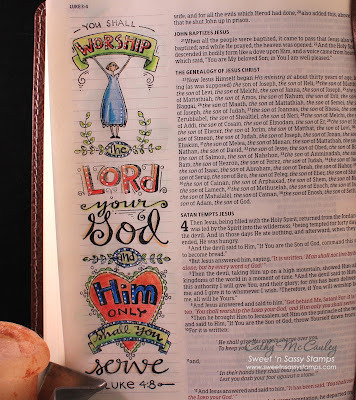 Creative Nugget: Every image in the Worship the Lord stamp set was used to create the Bible verse from Luke 4:8 in the margin of my Journaling Bible. StazOn Jet Black ink was used to stamp the images. This ink did not bleed through the page, although you can see a shadow of the images on the back of the page. The images were then colored with Prismacolor Pencils. A white Sharpie Paint Pen was used for the highlights. 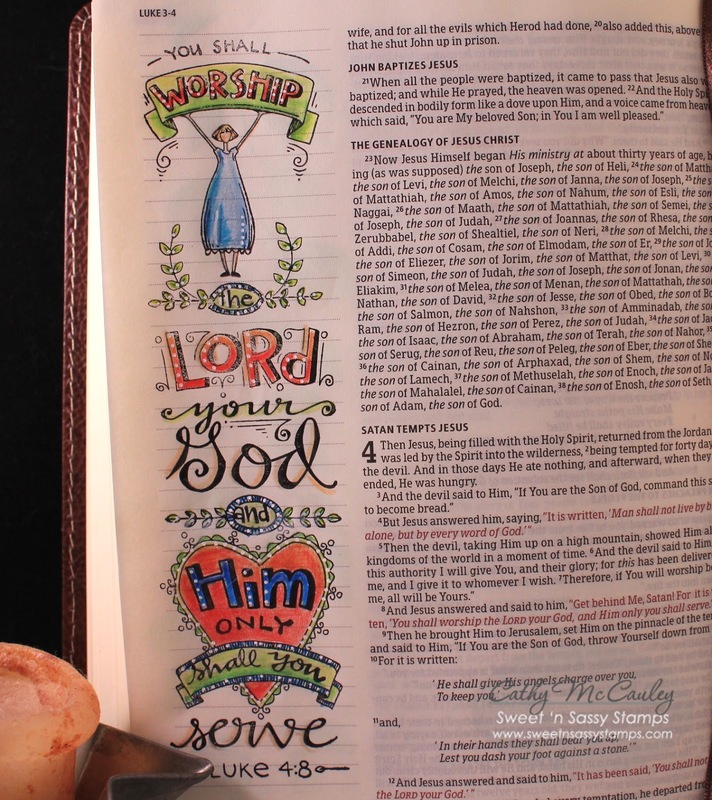 Please share your experiences with Bible Journaling in your comments. I look forward to learning what mediums work for you! 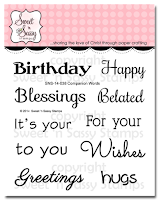 Then head on over to the Sweet 'n Sassy Stamps Store to check out all the new products and pick up your favorite stamp sets from the release! We just received a huge order so while you are there, you might also find that some of the favorites you have been waiting for are back in stock! More Dare to Get Dirty! Hello friends…happy Saturday! 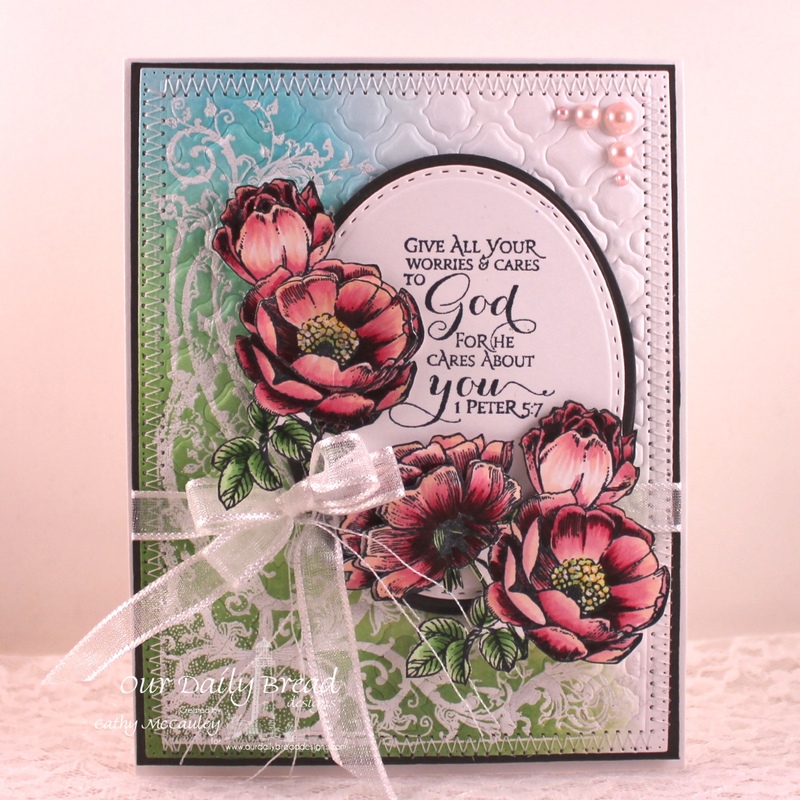 Well, "Dare to Get Dirty" week is just about over, but you can still upload cards until Monday so I have two more cards to share with you today using products from Our Daily Bread Designs! Creative Nugget: The Boho Paisley Background was white embossed, then watercolored. The triangle flap of Blushing Rose paper was stitched to the card front. 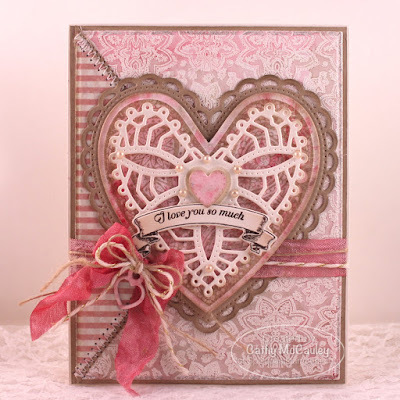 The Boho Love heart was stamped in Distress ink over a watercolored panel and cut and layered with the Ornate Heart Dies. The sentiment from the Banner Sentiments stamp set was cut with the banner in the Birdcage & Banner Die Set. Seam binding, twine, and a Mini Tag die cut were added to finish the card. Creative Nugget: Masking tape was used to lay down colors in a plaid pattern. The Boho Paisley Background stamp was clear embossed over the colors. 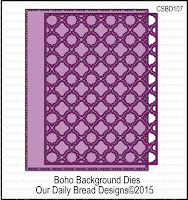 This panel was then cut with the Boho Background Dies. The little pieces were saved to be randomly placed back into the die cut. 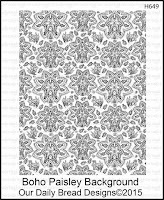 The white panel was also clear embossed with the Boho Paisley Background stamp. A plaid panel was added. The Boho Faith paisley was also stamped on a plaid panel and highlighted with a white paint pen. Part of one of the sentiments from the Boho Faith set was cut apart and popped onto the horizontal banner. 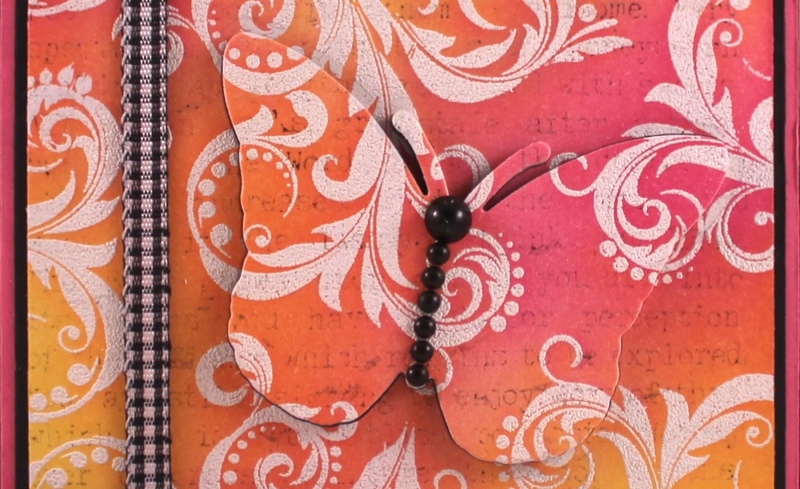 The butterfly from Butterfly & Bugs was stamped and cut with the matching Butterfly & Bugs Die. A few rhinestones were added to finish the card. 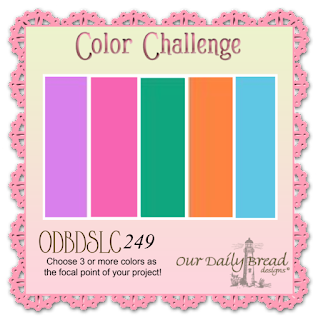 The color inspiration for this card came from the ODBD Shining the Light Challenge for this week. Hello friends! Welcome back for two more Dare to Get Dirty cards. I love the color orange, but don't use it very often. 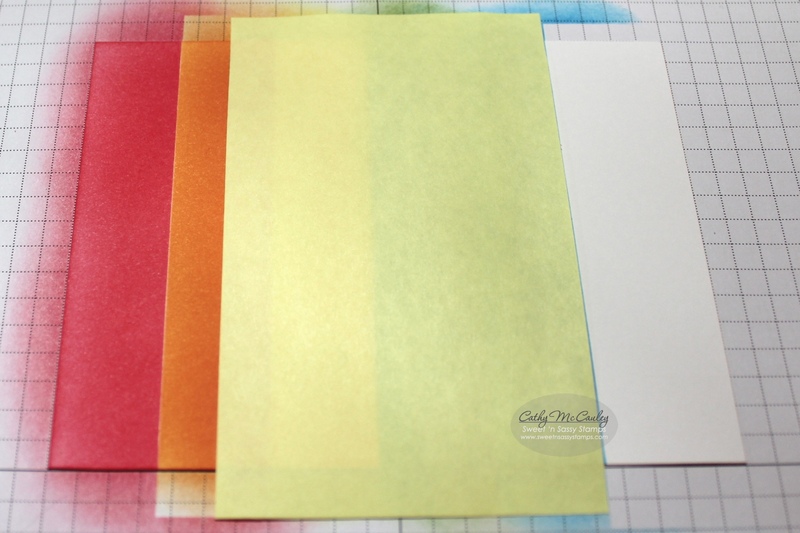 It is the perfect color for fall and fruity cards! 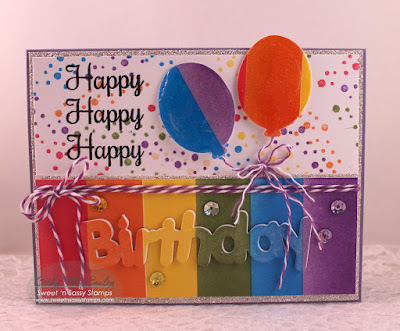 Creative Nugget: Sponging is a favorite technique and was used for all elements on this card. Sponging and splashes of water were used to create the background. Sponging and embossing were used for the stitched panel. Sponging and stamping were used on the leaves. 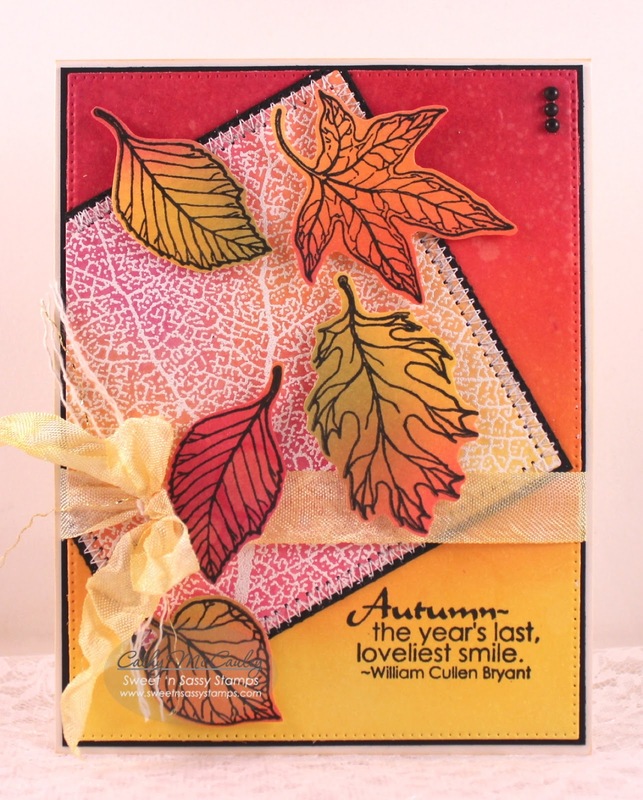 Autumn Leaves and the coordinating Autumn Leaves Dies are currently part of Sweet 'n Sassy Stamps Sweet Perks Club, but the bundle price is only good for one more week. 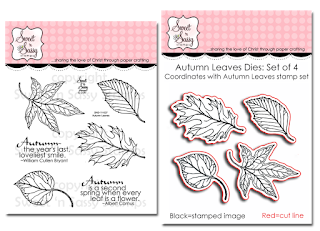 The Skeleton Leaves Background is the perfect companion for this bundle! This card was made for Lydia's DTGD Challenge. Creative Nugget: The background is watercolored with Kuretake watercolors on watercolor paper. The other papers were salvaged from by scrap box. 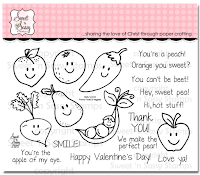 I just love this orange image and sentiment from the Punny Fruits & Veggies stamp set…he just makes me smile! The orange was masked and stamped three times, one of which was cut and popped up on an action wobble spring. Stitching and Baker's Twine finish the card. This card was made for my sketch challenge and two of the Dare to Get Dirty Challenges. Until next time…have a wonderful weekend! Hello friends! One of the favorite weeks of the year at Splitcoaststampers is going on right now…"Dare to Get Dirty 2015." 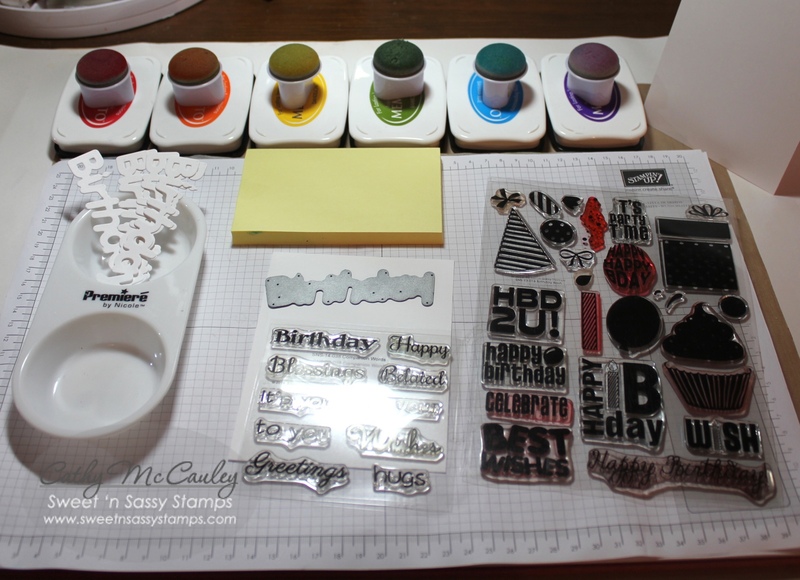 If you are a Fan Club Member at Splitcoaststampers, you can participate in the many challenges for a chance to win some awesome prizes. If you are not a Fan Club Member, check HERE for details on how to join. I'm never quite able to complete all of the challenges, but this year I'll give it my best shot…and I'll be sharing some of my challenge cards here. The following card was made for Cheryl's challenge. 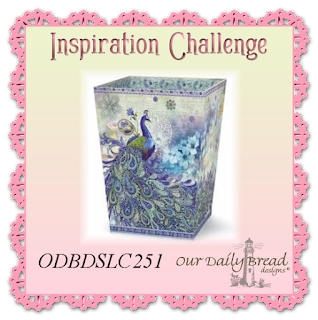 Cheryl has a gallery full of gorgeous floral cards so I decided to feature the beautiful Fragrance stamp set by Our Daily Bread Designs for her challenge. 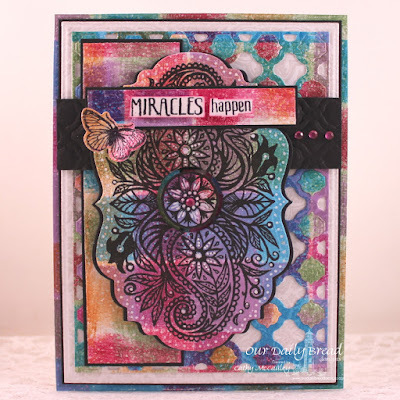 Creative Nugget: The background was made by white embossing the Belles Vignes corner stamp, then sponging distress inks over the embossing, but leaving the upper right corner white. Texture was added with the new Boho Background Dies and the panel stitched to Smokey Shadow card stock and attached to a Neenah Solar Crest card base. The roses from the Fragrance stamp set were colored with Copic Markers, fussy cut, and arranged around the oval frame made with the new Ovals and Stitched Ovals Dies. The sentiment is from the Scripture Series 3 stamp set. A bow and pearls finish the card. Oh, if we would all follow this example, we could say good-bye to the hatred, division, and strife which characterizes our world today. Hello, friends! 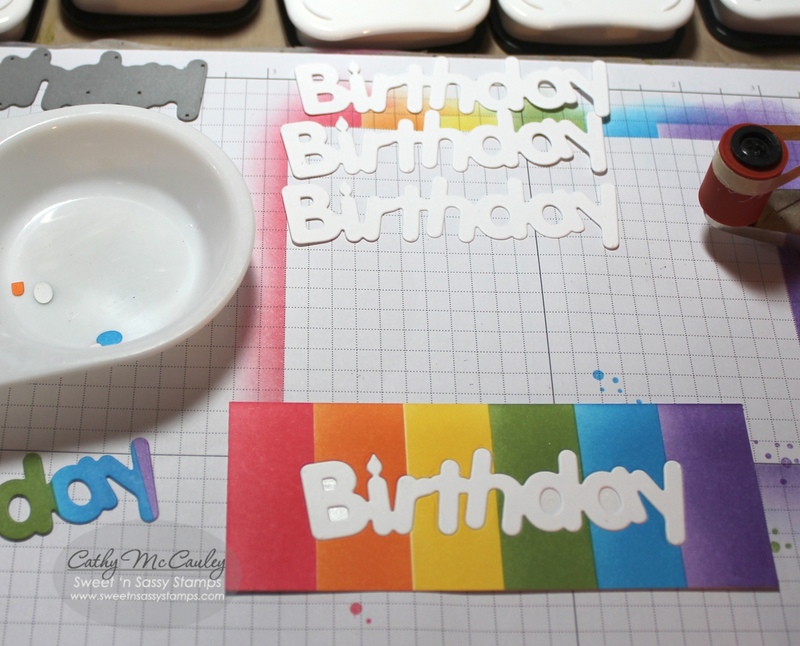 Today I'm sharing a die cut tutorial over on the Sweet 'n Sassy Stamps Blog and thought I'd share it here as well. 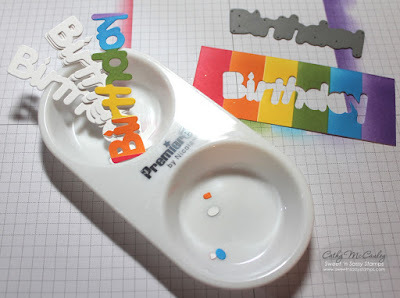 It's fun to try new things with all of the supplies we have in our stash, and I don't know about you, but my collection of dies keeps growing! LOL! 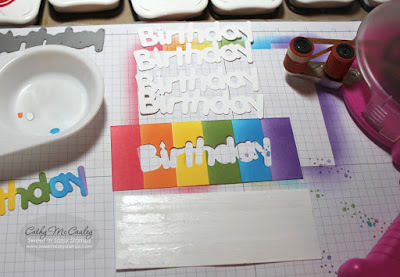 So…let's get started with Camouflaging Die Cuts! 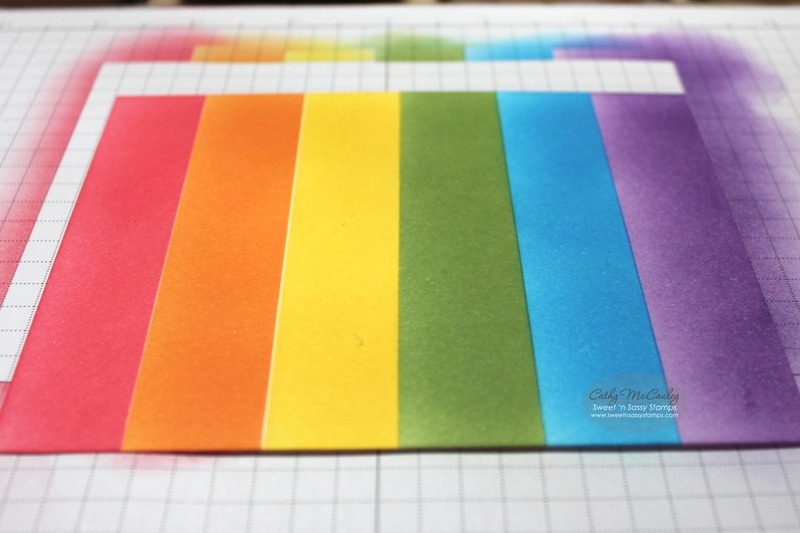 To create a rainbow of color, mask off the first section of your card stock panel. I just use Post-Its. 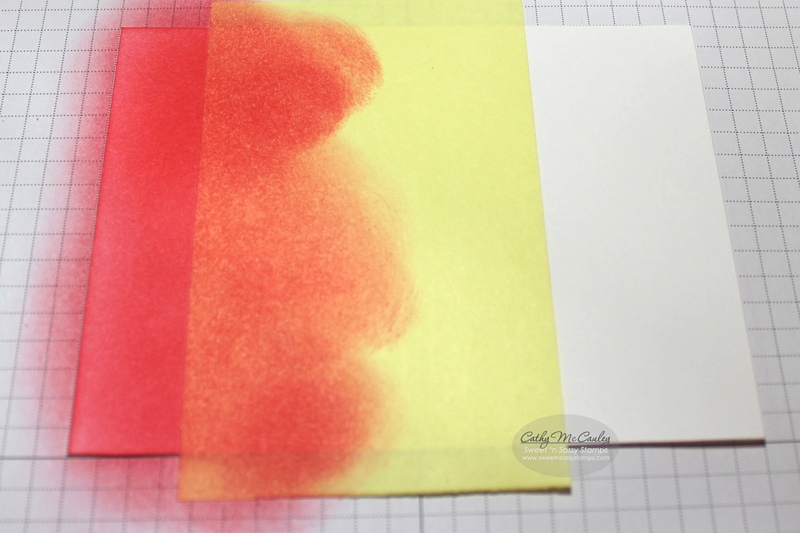 Starting on the Post-It and working in circles, sponge on your color until it is smooth and blended. Keep masking off each section as you work your way across the panel. Now you have a bright, cheerful rainbow! Trim your panel to the size you want for your card. 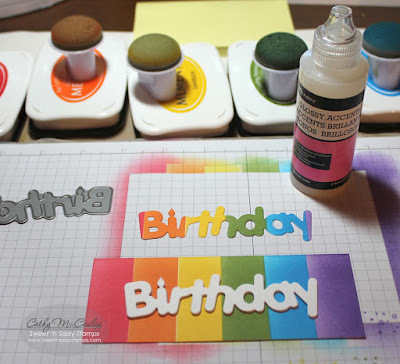 Using your die, cut the word or shape from your decorated panel. Be sure to save all the little pieces. Then cut more of the same die cuts from scraps of card stock. 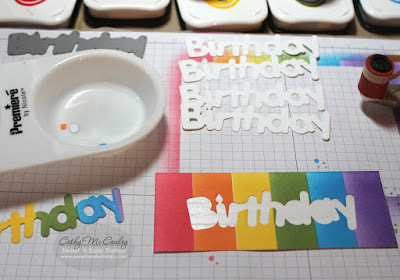 I cut 4, but you can make as many as you want depending on how thick you want your word or image to pop off the card. Cut a second panel the same size as your decorated piece and cover it with adhesive. I used my Glue Glider, but you can use a Xyron or any adhesive you like. …and pop one of the scrap die cuts in the negative space. Use the little pieces you saved to fill in the empty spaces. …ending up with the one you cut from your background panel. I use dots of Glossy Accents to glue the layers together because it gives me a little wiggle room to get the dies lined up correctly. Finish your card using your Camouflaged Die Cut! My little grand niece loves sparkles and purple…this card will be for her birthday. Another sample of Camouflaging Die Cuts using a shape instead of a word die. Hope you'll give this technique a try! Thanks so much for stopping by!